The proliferation of robots completing manual tasks traditionally done by humans suggests we have entered the machine automation age. And while nothing captures the imagination like self-directing machines shuttling merchandise around warehouses, most automation today comes courtesy of software bots that perform clerical tasks such as data entry. Here’s the good news: Far from a frontal assault on cubicle inhabitants, these software agents may eventually net more jobs than they consume, as they pave the way for companies to create new knowledge domain and customer-facing positons for employees, analysts say. 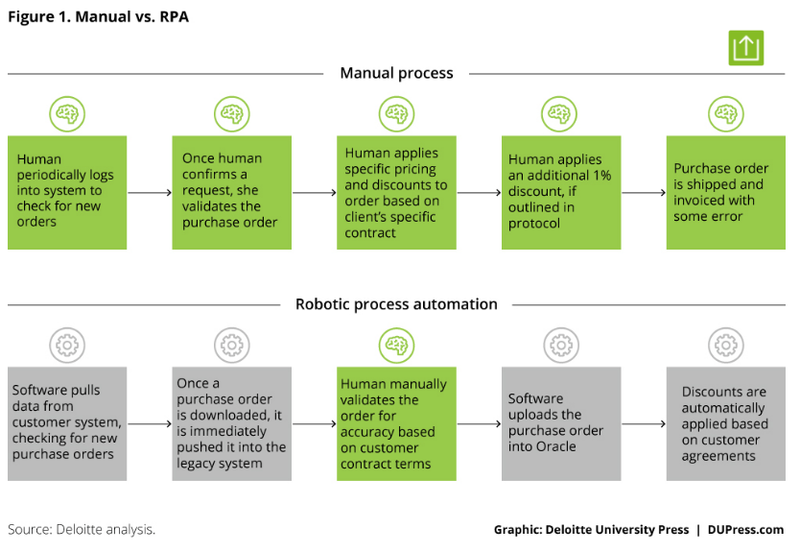 The approach, known as robotic process automation (RPA), automates tasks that office workers would normally conduct with the assistance of a computer, says Deloitte LLP Managing Director David Schatsky, who recently published research on the topic. RPA's potential will grow as it is combined with cognitive technologies to make bots more intelligent, ideally increasing their value to businesses. Globally, the RPA market will grow to $5 billion by 2020 from just $183 million in 2013, predicts Transparency Market Research. Bots mimic activities a human would perform, including anything from populating electronic forms to changing data in a customer account. Some bots log into an application, extract information from a web page, modify it and enter it into another application. At AT&T, bots pull sales leads from multiple systems, enabling staff to spend more time with customers. Bot benefits include the capability to cut staffing costs, reduce error rates associated with humans and improve customer engagement. For example, Schatsky says a bank redesigned its claims process and deployed 85 or bots running 13 processes, handling 1.5 million requests per year. The bank added capacity equivalent to more than 200 full-time employees at approximately 30 percent of the cost of recruiting more staff. A major appeal of bots is that they are typically low-cost and easy to implement, requiring no custom software or deep systems integration. Schatsky says such characteristics are crucial as organizations pursue growth without adding significant expenditures or friction among workers. "Companies are trying to get some breathing room so they can serve their business better by automating the low-value tasks," Schatsky says. There’s little question that many workers will lose their jobs as companies automate more business processes. Forrester Research last November estimated that RPA software will threaten the livelihood of 230 million or more knowledge workers, or approximately 9 percent of the global workforce. However, RPA will create new jobs as workers train up and pivot to new roles within their companies. RPA, along with physical, intelligent machines and other automation capabilities, will replace 16 percent of U.S. jobs but create the equivalent of 9 percent, yielding a net loss of 7 percent of jobs by 2025, says Craig Le Clair, a Forrester analyst who tracks the impact of automation technologies on the corporate sector. For instance, Wolters Kluwer reallocated money saved using RPA to close its books to hire a financial analysts to analyze profits, revenue, planning and forecasting. Le Clair also says increased RPA will give rise to "cognitive sommeliers," or staff who understand domains and curate knowledge bases for an application area. Moreover, as the glut of information increases, particularly in financial services, customers will need more human advice than ever before, Le Clair says. Most bots stick strictly to their business logic rules but that is changing. If the machines can become smarter, the popular thinking goes, businesses will be able to use them in more complex operations. Paired with chatbots, natural language processing, machine learning and other tools, RPA can extract and structure information from audio, text, or images, as well as identify patterns and pass that information to the next step of the process. Bots are already making a difference in how businesess interact with customer. At Vanguard Group, sophisticated algorithms called “roboadvisors” pair with humans to offer clients tailored investment advice.Virgin Trains has deployed cognitive RPA to automatically refund customers for late running trains. As customer emails arrive, a natural language processing tool gauges meaning and sentiment and then recognizes key information in the text to service the customer, reducing daily processing time and manual labor involved in dealing with customer emails by 85 percent. "Cognitive RPA has the potential to go beyond basic automation to deliver business outcomes such as greater customer satisfaction, lower churn, and increased revenues," Schatsky says. However, Schatsky cautions, cognitive RPA has been slow-going due to the complex nature of blending the technologies with existing systems, as well as the lack of required skills to implement them. To bridge that talent gap, IBM and Blue Prism have inked a joint agreement to work together on cognitive RPA. Organizations piloting the most basic bots must clear change management, governance and security hurdles, says Forrester’s Le Clair. 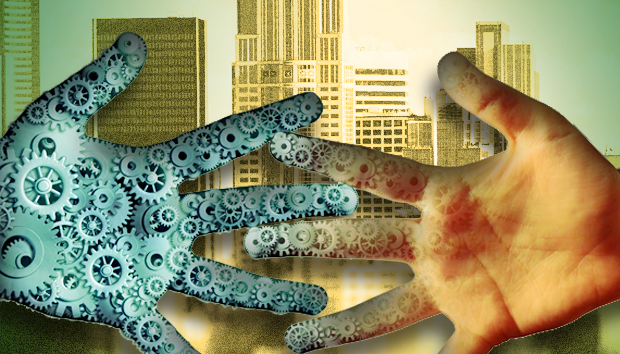 Implementing too many interdependent bots can wreak havoc on existing systems. Bots can also create turmoil when paired with workers who must learn to work with their new virtual colleagues. Moreover, because most RPA tools reside on desktops, implementations in environments that are highly virtualized -- where information from thousands of PCs resides on centralized servers -- can be clumsy. "They have integration problems with more sophisticated VDI [virtual desktop infrastructure] implementations," Le Clair says. Schatsky says that CIOs should introduce RPA quickly in increments but scale it up slowly. "Start small and start fast," Schatsky says. "If you see early success, you need to take a step back and start thinking more strategically about how you scale up in terms of governance and your staffing model."